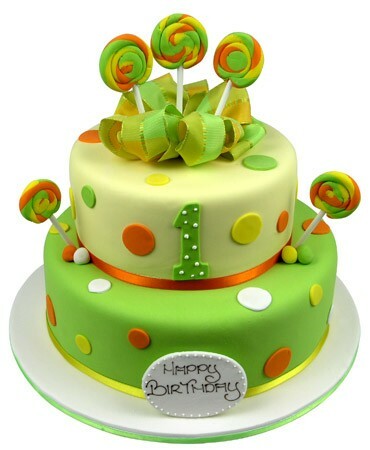 This bright and funky two tiered birthday cake is iced with lemon and lime green coloured icing and is decorated by multi-coloured dots and handmade lollipops. Perfect for kids with a really sweet tooth. This impressive two tier birthday cake has lemon coloured icing on the top tier and lime green coloured icing on the bottom. The top tier is covered in yellow, orange and lime green spots, whilst the bottom tier has yellow, orange and white spots. The cake is topped with a colourful yellow, green and orange printed ribbon bow & 5 handmade sugar lollipops that explode from the cake. 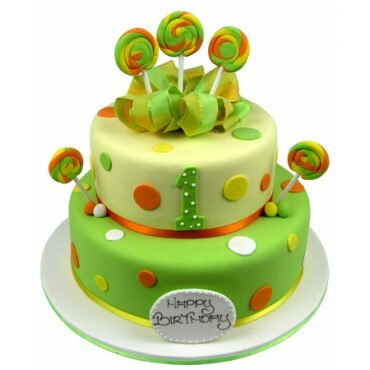 A lime green sugar number 1 sits at the front of this cake.